Videos can be downloaded by clicking the buttons below. AVI files are in 1080p and will require VLC (or similar player). Alternatively MP4 files are available in 720p. Description: This video shows a series of slices through a 3D MARS image of an ankle. In beige is material identified as lipid-like, such as skin and cartilage, soft tissue and muscle is in red, and bone is in white. Description: This video shows a rotation around a 3D MARS image of an ankle. The bones of the ankle and an area of lipid-like material padding the heel region can be seen. The skin and muscles have been made partially translucent to show the interior of the ankle. Click on the picture to download full size image. 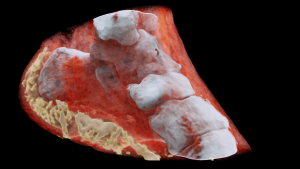 A 3D MARS image of an ankle viewed from the side where the soft tissue (coloured in red) has been made translucent to show the bones (white) and lipid-like material (yellow) inside the ankle. 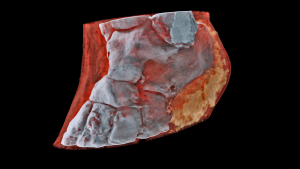 A 3D MARS image of an ankle viewed front on where the soft tissue (coloured in red) has been made translucent to show the bones (white) and lipid-like material (yellow) inside the ankle. 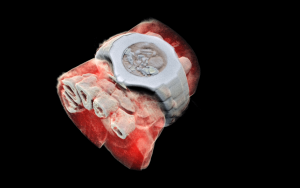 A 3D MARS image of a wrist with a watch showing part of the finger bones in white and soft tissue in red. 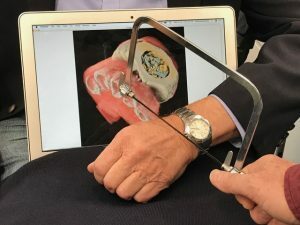 Prof Phil Butler displays the area of his wrist that was scanned as one of the first human images taken using the MARS large bore spectral scanner. Copyright 2015-2018 MARS Bioimaging Ltd. | Christchurch, New Zealand | Contact us Privacy: We use Google Analytics, a web analysis tool, to monitor and report on the performance of our website. We combine the information in a way that doesn’t identify individual visitors and use it to help us improve the site.